Importance. -- This defoliator occurs over much of the East. It defoliates trees in parks, campgrounds, picnic areas, and along city streets. However, forest stands of red and white oaks on upland sites suffer most when outbreaks occur. Identifying the Insect (figure 3 a). 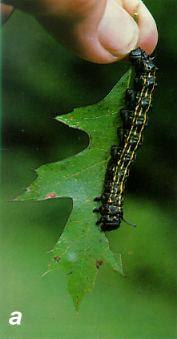 -- The larva is black with eight narrow yellow stripes; it is about 2 inches (50 mm) long. There is a pair of long, curved "horns" on the second thoracic segment. The adult moth is yellowish red; forewings are orange purple and each has an oblique band and white spot. Identifying the Injury (figure 3 b). -- Young larvae feed in groups, skeletonizing the leaf. Later, they consume all but the main veins. Older larvae are less gregarious and can be found crawling on lawns and sides of houses. Biology. -- Adults appear in June and July, and deposit clusters of several hundred eggs on the underside of leaves. The eggs hatch within a few days and the caterpillars feed during July to September for 5 to 6 weeks. In the fall, mature larvae pupate in the soil, where they overwinter. There is generally one generation per year. Control. 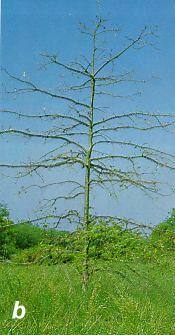 -- Natural enemies generally prevent widespread defoliation, but chemical control may be needed for high-value trees. Figure 3. -- (a) Organgestriped oakworm larva; (b) tree defoliated by orangestriped oakworm.